Gorely (Russia). During 17-25 June seismic activity was above background levels and gas-and-steam plumes rose from the crater. A newly-opened vent on the crater’s inner SE wall above the level of the lake, incandescent and emitting gas at temperatures of 800-900 degrees Celsius, was observed on 17 June. Analysis of satellite imagery showed a thermal anomaly during 17-18 and 21-23 June. Cloud cover prevented observations on other days. The Level of Aviation Colour Code was raised to Yellow. Pagan (Mariana Islands). Minor gas-and-steam plumes continued to be observed in satellite imagery during 18-25 June. The Aviation Colour Code remained at Yellow and the Volcano Alert Level remained at Advisory. Tungurahua (Ecuador). Steam-and-gas plumes were seen on 22 and 23 June and steam-and-ash plumes were seen during 24-28 June. The plumes rose as high as 1 km above the crater and drifted NW, W and SW. During most days ash fell in areas within 8 km SW and occasionally in areas 8 km W and NW. Roaring noises were sometimes heard, and on 25 June were followed by vibrating windows 8 km W and SW. Lahars on 26 June traveled down drainages to the NW and W carrying blocks up to 2 m in diameter. On 27 June ashfall was reported from areas 23 km NW and 25 km W. During 27-28 June incandescence emanated from the crater at night. Ulawun (Papua New Guinea). White-to-grey plumes were reported during 23-25 June and fine ash fell on the SW and NW flanks. Low rumbling was heard and dull fluctuating incandescence was observed for a brief period of time from the SE. During 25-26 June white to grey-brown plumes rose 600 m. Seismicity, dominated by volcanic tremor, remained at a moderate level until 26 June, when Real-time Seismic-Amplitude Measurement (RSAM) values declined. Dukono (Indonesia). Darwin VAAC reported that during 23-24 and 29 June ash plumes rose to 2.4 km a.s.l. and drifted 120-225 km W.
Eyjafjallajökull (Iceland). The Nordic Volcanological Center (NVC) at the Institute of Earth Sciences reported on 23 June that small ash clouds from the summit caldera were occasionally seen, but dispersed quickly. Water was slowly accumulating in the crater because ice was no longer in contact with hot material. Karymsky (Russia). KVERT reported a thermal anomaly over the volcano during 17, 19-20 and 22-23 June. Small ash clouds 10 x 8 km and 12 x 5.5 km in dimension were seen E of the volcano on 17 and 23 June respectively. Tokyo VAAC reported that an eruption on 29 June produced a plume that rose to 7 km a.s.l. Ash was not identified on satellite imagery. The Aviation Colour Code level remained at Orange. Kilauea (Hawaii, USA). During 23-29 June activity continued from the summit and the east rift zone. At the summit the level of a lava-pool surface in the deep pit inset within the floor of Halema’uma’u crater remained mostly stable; glow from the vent was also visible at night. A plume from the vent mainly drifted SW dropping small amounts of tephra and occasionally fresh spatter downwind. At the east rift zone lava flows that broke out of the TEB lava-tube system built up a number of rootless shields between 580 and 520 m elevation. Satellite images showed thermal anomalies from minor lava flows originating from the shields. The Pu’u ‘O’o web camera showed incandescence from a vent on the E wall of the crater. Kirishima (Japan). Tokyo VAAC reported a possible eruption on 28 June. Information about a possible resulting plume was not reported. Kliuchevskoi (Russia). 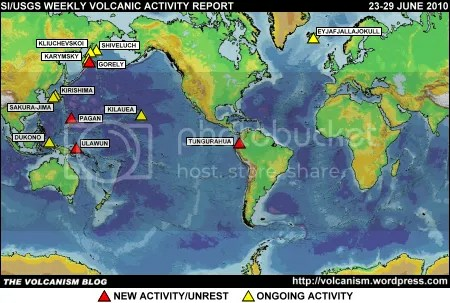 KVERT reported that during 18-25 June seismic activity was above background levels and Strombolian activity was sometimes observed. Ash plumes occasionally rose to 5.5 km a.s.l. Satellite imagery analysis revealed a large daily thermal anomaly from the volcano and ash plumes that drifted 120 km in multiple directions during 19 and 22-23 June. The Aviation Colour Code level remained at Orange. Sakura-jima (Japan). Tokyo VAAC reported that during 23-29 June explosions sometimes produced plumes which, along with ash plumes occasionally seen by pilots, rose to 1.8-3.7 km a.s.l. and drifted E, SE and NW. Shiveluch (Russia). KVERT reported that during 18-25 June seismic activity was above background levels and suggested that possible ash plumes rose to 5.1 km a.s.l. Strong fumarolic activity and hot avalanches were observed during 21-23 June. An ash plume was seen rising to 6.5 km a.s.l. on 23 June. Satellite imagery showed a large daily thermal anomaly over the lava dome and an ash cloud 5 x 5 km in dimension 30 km SE on 23 June. The Aviation Colour Code level remained at Orange. 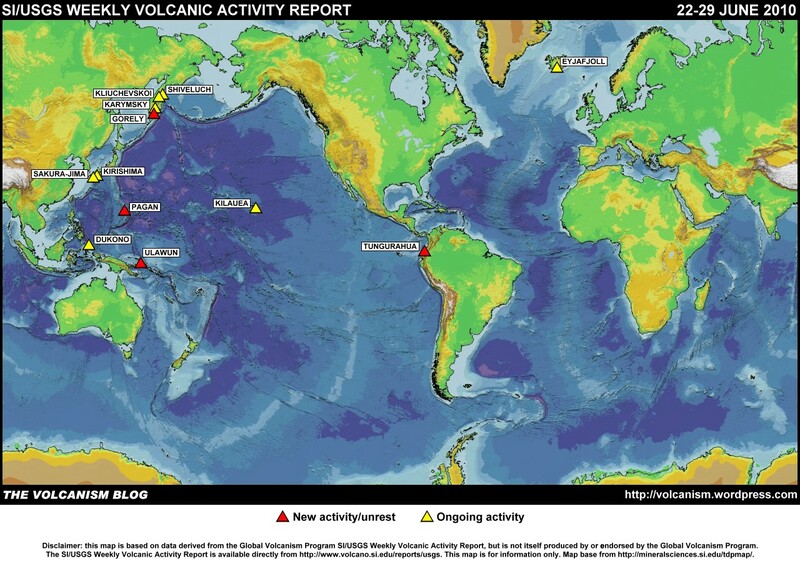 The foregoing is a summary of the Smithsonian Institution/United States Geological Survey Weekly Volcanic Activity Report covering 23-29 June 2010. It is provided for information only, and is based on but not a substitute for the full report, which comes with its own criteria and disclaimers. The map base is derived from the Smithsonian Institution/USGS/US Naval Research Laboratory This Dynamic Planet website.